C Alkaline (LR14, MN1400, C) Batteries. Battery equivalent to LR14 Rayovac 814, Varta 4014, C, Panasonic AM2, Energizer Ever Ready E93, BABY. Length: 50 mm. Diameter: 26.2 mm. Price: £5.40 each twin-pack. £3.59 each twin-pack if you buy two or more. Postage and packing included (which is a significant part of the price). This disposable alkaline C sized or LR14 popular small cylinder battery is commonly used in battery powered toys, portable radios, torches, calculators and many other battery powered applications. These alkaline C sized or LR14 cells have a good specification. These 1.5 volt Size C alkaline batteries give superior performance over zinc chloride and carbon zinc batteries and are specially suited to today's high tech products. These alkaline C sized or LR14 batteries last six times longer than ordinary zinc carbon batteries, and for some applications, up to 14 times longer. 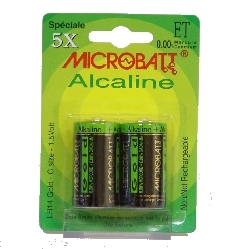 These alkaline C sized or LR14 batteries have a shelf life in excess of four years. Why not buy two or more packs, take advantage of our reduced price and make sure you are not left unable to use your device next time your battery runs out.